The Atlantic Flying Fish has a body shaped like a tube, a long tail fin, and large pectoral fins that it uses to glide above the water. It does not fly in the way that birds do; instead this fish can jump up to 3 feet out of the water and use its fins to hold it steady as air currents pass by. The tail acts like a motor--as the fish glides it may wave the tail back and forth to gain speed. The Atlantic flying fish can grow to be 15 inches in length, but most are about 10 inches long. They are greenish or blue above and have pale undersides. 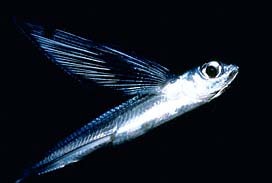 The Atlantic flying fish lives close to the surface of the water. It likes ocean water and has been seen all along the eastern coast of the USA, from Cape Cod to the Gulf of Mexico. They usually swim in groups and eat smaller fishes, plankton, even small crustaceans. Their ability to glide in the air keeps them safe from enemies such as dolphins, swordfish, and tuna that try to eat them. The female flying fish lays eggs in a bed of seaweed in the water. As the eggs float, a white string-like material catches on the seaweed and holds the eggs there until they are ready to hatch. The female does not tend her eggs--the young flying fish are on their own.